Beginning Tuesday, September 4 you will be able to “instant message” the library for help. With this live, online reference service, librarians will be on hand to answer your questions via instant messaging from 2:00 – 4:00 p.m. Monday through Friday. Initially a service of the library’s Southern History Department for genealogical questions, the instant message reference service now extends to the library’s comprehensive general collection and will cover topics in arts, sciences, social sciences, humanities, business, government and everything else the library has to offer. Ask your question and leave it to the professionals and their arsenal of tools to locate an answer and type it back to you ASAP. Instant messaging is faster than e-mail and allows users to see and save the written conversation. All you need to do is to add “BhamLibrarian” to your AOL (AIM) or Yahoo buddy list, ask a question, and receive an answer in real time. Real time, real fast, really! The Birmingham Public Library is pleased to announce that the Avondale and Springville Road Branch Libraries are the first in Alabama to be designated as Family Place Libraries™. Family Place Libraries™ is a network of children’s librarians nationwide who believe that literacy begins at birth, and that libraries can help build healthy communities by nourishing healthy families. Family Place Libraries™ welcome infants and toddlers and their families and caregivers. Special areas in the Youth Departments at Avondale and Springville Road Branch libraries have been created to entice young children and parents to play together. A collection of parenting materials and resources are displayed in the children’s area so that parents have easy access for reading while visiting the library and for check out. One of the key components of Family Place Libraries™ is an organized time for children birth through age 3 and their parents to play and learn together. 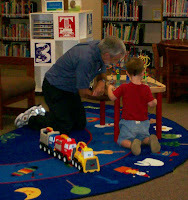 The five week program, “1,2,3 Play with Me” will be held at the Avondale Public Library on five consecutive Wednesdays beginning September 5, 2007 at 10:30 a.m. This one hour and fifteen minute program features toys, an art experience, books, play and circle time. Community resource professionals will be on hand to discuss parenting questions and concerns. Topics include nutrition, speech and hearing, child development, and music and movement. Space is limited at each site so pre-registration is required. Call the Avondale Branch Library at 226-4003 for more information and registration. The “1,2,3 Play with Me” program will be repeated beginning October 25, 2007 at the Springville Road Branch Library. You may register for these sessions by calling 226-4085. The Birmingham Public Library will launch the 3rd annual Read It Forward project in September 2007. Read It Forward is a community-wide reading program designed to encourage teenagers to read. The concept is based on the book Pay it Forward by Catherine Ryan Hyde. It is a story about an eighth grader who decides to change the world by doing a good deed for someone and then asks that person to “pay it forward” by doing the same for others. This year’s Read It Forward selection starts off early with a bang, or rather, an eruption! 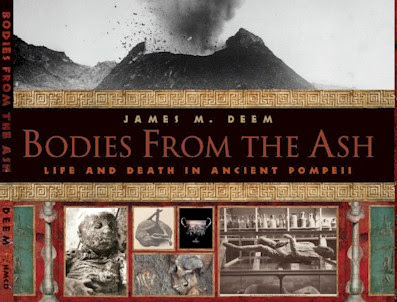 The non-fiction book Bodies from the Ash by James M. Deem has been selected to be read in conjunction with the Birmingham Museum of Art’s exhibit Pompeii: Tales from an Eruption. Bodies from the Ash tells the story of the eruption of Mount Vesuvius in 79 A.D. and the destruction and preservation of the Roman cities Pompeii and Herculaneum. The book includes lots of photographs that vividly tell the story of what happened to the residents of Pompeii during this historic event. The Birmingham Public Library will host book discussions, a special visit from James M. Deem, the author of Bodies from the Ash, on November 5 and 6, 2007, and other events. Read It Forward 2007 is sponsored in part by the Literacy Council, American Cast Iron Pipe Company, and the Rotary Club of Shades Mountain Sunrise Foundation. We experienced a wonderful summer filled with lots of exciting programs presented by the Birmingham Public Library storytellers and librarians. A total of 381 programs were offered in the 20 Birmingham Public Library locations during June and July with an attendance of 18,498. The libraries hosted a variety of programs including arts and crafts, movies and popcorn, video and board games, and even “grub down” with the resident library animals. A variety of special guest performers included the Umdabu Dance Company, the McWane Center, the Jefferson County Sheriff’s Department, Magic Man Larry Moore, storytellers Andy Offutt Irwin and Carolyn Baylor and 12 year-old Elvis impersonator, Alex Swindle. 5,422 kids registered for participation in the summer reading program and read a total of 59,841 books. This number includes 579 teenagers who registered to participate. We are pleased to report that 71% of the total participants completed the summer reading requirements and were issued certificates of completion along with various other treats and rewards. This is a record high! The Birmingham Public Library would like to express a special thanks to our Summer Reading Partners: Barnes and Noble Booksellers, Bright House Networks, Chick-fil-A, City of Birmingham Division of Youth Services, The Junior League of Birmingham, McWane Center, and Rally’s. Learn all about BPL's Databases and use these resources to help make homework reports and projects easy. Live Homework Help is available Sunday through Thursday 3:00 pm to 10 pm. Librarians are available by email, telephone, and instant message. Keep up with programs, activities and computer classes going on at your library. Search the catalog and receive news and information about the library as a BPL MySpace friend. ­­­­­­­­­­­­­­­­­­­­­­­­­­­­­­­­­­­­­­­­­­­­­­­­­­­­­­­­September is National Library Card Sign-up month! Birmingham Public Library encourages library users to sign up for a library card or trade old wallet library cards for a new keychain card for FREE! We are waiving the usual replacement fee for the month of September only. Visit your local library and discover all your card can do for you. 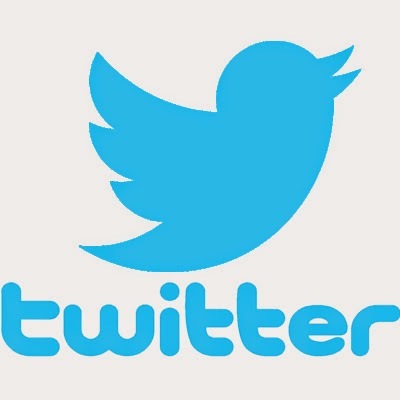 Or visit us online http://www.bplonline.org/ to discover your 24/7 virtual library. All locations of the Birmingham Public Library will be closed Sunday, September 2 through Monday, September 3 for Labor Day. The Birmingham Public Library has unveiled its first podcast. In this monumental piece, the library interviews David Ramp, Director of UAB's Small Business Development Center, about the upcoming library series entitled "Building Blocks for Your Small Business @ Your Library." “Marketing Your Business” will be held from 9:00-11:00 on Wednesday, September 26, 2007. “Protecting Your Business” will be held from 9:00-11:00 on Wednesday, October 3, 2007. “Financing Your Business” will be held from 9:00-11:00 on October 17, 2007. Seminar leaders include members of S.C.O.R.E., the Service Corps of Retired Executives, and UAB's Small Business Development Center. So, if you're considering starting a business or have already done so, please join us. All sessions are free and open to the public and they will be held at the Downtown Library in the Arrington Auditorium. We hope you will enjoy the podcast and look for more in the near future. The Birmingham Public Library is proud to host award winning storyteller, Diane Ferlatte. Diane is known for her humor, depth, and tenderness, as well as for the intimate and personal rapport she has formed with audiences worldwide for over 20 years. An award winning artist, Ferlatte loves to tell African American stories, as well as stories that touch upon our common humanity. Her latest recording, Wickety Whack, Brer Rabbit is Back has received the 2007 Parents’ Choice Gold Award, The American Library Association’s 2007 Notable Children’s Recording Award, and the 2007 iParenting Media Award. 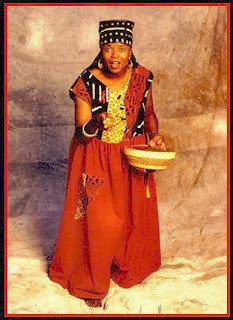 A Storytelling Circle of Excellence recipient, Ferlatte has toured and performed internationally, including Holland, France, Sweden, Australia, Singapore, and Malaysia. Musician Erik Pearson accompanies Ferlatte on banjo and guitar. Central Library – 10:30 a.m.
Five Points West Branch Library – 6:30 p.m.
Smithfield Branch Library – 10:00 a.m.
North Avondale Branch Library – 1:00 p.m.
West End Branch Library – 3:30 p.m.
Springville Road Branch Library – 6:30 p.m.
Blair Underwood has pulled out the big guns for his first novel by teaming up with husband and wife authors Steven Barnes and Tananarive Due. Their collaboration on Casanegra: A Tennyson Hardwick Story is garnering praise from book critics, readers, and fans of Underwood’s day job—acting. 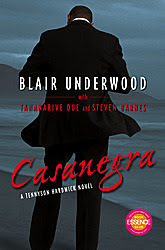 Casanegra is a play on the classic movie title Casablanca, and it is the first in a series about Tennyson Hardwick’s adventures in the seedy city of Hollywood, California. Ten Hardwick is a former gigolo and current actor-on-the-rise. When he reunites with rapper Afrodite, a former client, he becomes a suspect in her murder. Hardwick has to use his charm, good looks, and street smarts to clear his name. Casanegra mixes vintage noir with an urban fiction edge. There is plenty of police corruption, gangster rivalries, action, and steamy scenes to keep you entertained as Hardwick goes on a manhunt for the real killer. With the book taking off as it has, you can bet that a team of screenwriters are busy getting it ready for the big screen. Want to Knock $2 Off Your Fines? The August/September/October edition of The Reader contains a short survey. The feedback we receive will help our libraries better serve our patrons. To thank you for your efforts, a $2 coupon is included with the survey. Just present the completed survey and coupon to your local library for payment on fines accrued. The coupon is not good for payments on lost or damaged items. Limit one coupon per card holder. One time use only. Coupon expires October 31, 2007. Don’t have any fines? We’d still like to hear from you. Just mail the survey to JCLC, Reader Survey, 2100 Park Place, Birmingham, AL, 35203, or drop it off at your local library. You may also fill out the survey online. A long lost novel by Alexandre Dumas was discovered in the National Library in Paris by longtime Dumas scholar, Claude Schopp. The book was originally published as a serial in a magazine, and once Schopp discovered one piece of the book, he embarked on a search to find all of them. It took him 15 years to piece together the book, and another 5 years to edit it. The Last Cavalier is a classic Dumas story of revenge set in the Napoleonic era. The book, which was published in France in 2005, has sold 250,000 copies. Many critics are saying that it is reminiscent of the author's most popular works, The Three Musketeers and The Count of Monte Cristo. Pegasus Books will publish it in the USA this September. Join Count Hector de Sainte-Hermine in his adventures by reserving your copy in advance. Children’s Hospital and the Birmingham Public Library have partnered to provide Children’s patients with an enchanting story time. Beginning August 27, one of the library’s storytellers will visit the hospital monthly to entertain patients through this time-honored oral tradition. Using voice and motion, the storytellers will engage the patients by weaving music and art into their stories. The storytellers will visit the hospital the fourth Monday of every month. On alternate Mondays, Bright House Networks has provided the hospital with DVDs of taped story times to be shown in patient rooms. The Children's Hospital of Alabama is the only hospital in the state dedicated solely to the care and treatment of children and one of the 10 busiest pediatric medical centers in the U.S. One of only about 45 freestanding acute care hospitals of its kind in the nation, Children’s Hospital is home to Alabama’s only Level I pediatric trauma center. Children’s campus includes the largest pediatric burn center in the Southeast, one of the largest pediatric outpatient centers in the country and a leading pediatric hematology/oncology center and bone marrow transplant program. Although Children’s is the primary site for all pediatric educational programs and patient care activities within the UAB Medical Center, Children’s Hospital is a private, not-for-profit hospital governed by a volunteer board of trustees. Children’s will celebrate its centennial anniversary in 2011. I rarely get my news from newspapers anymore, but when I do peruse the paper I head to the commentary section to see what’s on the minds of journalists and my fellow citizens, and, most importantly, to see the editorial cartoons. My poor husband who’s trying to eat his meal in peace has to endure my tsk-tsking if I don’t agree with a cartoon, snickers if I do, and rants if I’m really offended. Scott Stantis, Hoover resident and editorial cartoonist for The Birmingham News, is one of my favorites and his cartoons are usually right on the money. Case in point is his recent cartoon showing two devils in hell wiping the sweat from their brows saying, “Man! It’s hot as Birmingham today!" Heh heh. 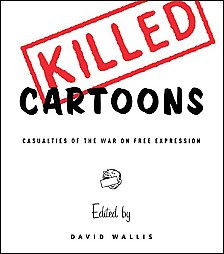 I picked up Killed Cartoons off the library’s 1st floor display shelf because I just had to see what cartoons were so controversial that an editor would refuse to print them. I thought editors thrived on controversy. Isn’t this what sells best these days? I was surprised to find out this isn't always the case. Every chapter includes the controversial cartoons and the history behind the killings, along with comments from the cartoonists and occasionally the editors. No subject is taboo: abortion, gun control, suicide, religion, and even the Holocuast and 9/11. There’s plenty insulting of world leaders going on. A few memorable ones are President Bush’s “electile dysfunction” and Bill Clinton’s strategically placed saxophone, along with his “I’m with stupid” T-shirt with the finger not pointing sideways. Curious about Schindler’s other list or Martin Luther King’s other dream? If you're not easily offended, go ahead and give it a try. 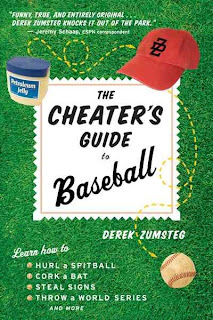 The Cheater’s Guide to Baseball by Derek Zumsteg. I loved this book. How can you not love a book that promises to teach you how to “hurl a spitball, cork a bat, steal signs and throw a world series?” And Zumsteg actually carries out on his promise and shows you how to cheat in these and many other nefarious ways. But it’s all in good fun. Honest. Really. Zumsteg, who writes for Baseball Prospectus, believes that cheating is what made baseball the game we have today. He argues that over the game’s long history, cheating has compelled the authorities to write new rules, change existing rules, and otherwise adapt to create the wonderfully complex, compelling game that we have today. As a former Boy Scout I’m not sure I buy this. Cheating is cheating. Still Zumsteg’s presents a hilarious history of the game through the rules and those who tried to circumvent them. My favorite example of his theory is physical contact on the base paths. Now, originally, baseball was not envisioned as a full body contact sport. However, the fact that there was only one umpire on the diamond encouraged some players to trip, hit, or otherwise impedes base runners. When it came to such physical contact the 1890’s Orioles and Reds were the teams to watch. In one game “Harry Vaughn, the Reds first baseman, is blocked by McGraw [the Orioles first baseman and manager] as he tries to round third and go home. McGraw uses both arms to restrain Vaughn at his neck, but Vaughn escapes and scores. McGraw later spikes Vaughn in a play at first base. The two exchange words, and when McGraw walks to the dugout, Vaughn throws the ball at him and hits him squarely in the back.” Now many people would simply take home the lesson that turning your back on the opponent is potentially painful and should be avoided. The baseball powers-that-be decided to add additional umpires. The Cheater’s Guide is broken into chapters covering the history of doctoring the ball, corking the bat, stealing signs, and creative groundskeeping. The last two chapters deal with gambling and steroid abuse and are the only two chapters devoid of any humor. Regardless of whether you were a Boy Scout, you’ll find The Cheater’s Guide funny and a little thought provoking. Honest. 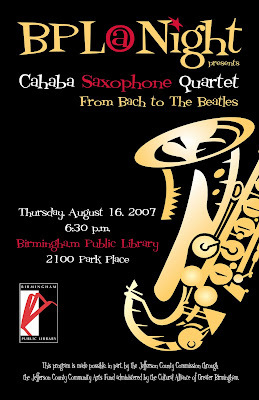 BPL @ Night will present the very popular Cahaba Saxophone Quartet on Thursday, August 16th, at 6:30 p.m. in the Atrium of the downtown library. This professional group of musicians will offer saxophone music from a wide range of genres: from Baroque to Contemporary. Movie Review: "Bridge To Terabithia"
I recently had the pleasure of viewing the dvd, “Bridge To Terabithia”, based on the Newbery Medal-winning children’s classic. I encourage everyone to watch this film and allow themselves, for a time, to become lost in a far away magical kingdom called "Terabithia". Perhaps we should all make more time to occasionally revisit old friends we made while reading well-worn but favorite children’s books. If you have never read the book, you will be enchanted by this imaginary world created by Jess and Leslie. Jess Aaron is finally the fastest boy in school, that is until Leslie Burke moves into the small town community. The Aarons are a farm family and often have financial difficulties. Jess’ interest in art and his imagination are difficult for his family to understand. On the other hand, Leslie’s parents are writers and spend much of their time meeting deadlines to finish books. Both Jess Aaron and Leslie Burke are lonely and desperate to feel a sense of belonging. Of course, they quickly become the best of friends. Jess and Leslie run in the woods, swing from vines and finally build a tree house that enables them to escape from problems at school and home. Through their imagination, they are able to create a fantastic, magical world filled with castles, giants, ogres and fairies. We learn about the power of friendship, love and the ability of imagination to change lives. The efforts made by the film producers to create the kingdom of "Terabithia" were impressive. Through this world of imagination, Jess is able to cope with a final tragedy that touches everyone in the community. 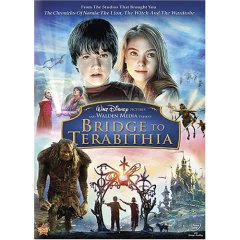 The “Bridge To Terabithia” symbolizes a path or progression, ultimately allowing both children to grow stronger through love and the use of imagination. Both Jess and Leslie are affected in a positive way as a result of their friendship. If you enjoy positive movies that dare to transport you into a world of magical dreams, watch this film. You will definitely enjoy the experience! We all sometimes need to escape and maybe create our own "Terabithia". The Birmingham News today reports that Jefferson County Public Library Cooperative's new program for parents and their babies will begin in September. Jefferson County libraries and the United Way are aiming to put free books into the tiny hands of 10,000 babies born annually in the county's seven maternity hospitals, starting in September. . . . To read the rest of the article click here. Due to air-conditioning problems, Powderly is closed today. The Birmingham Public Library was awarded $15,000 by the Jefferson County Community Arts Fund for BPL @ Night—a series of evening programs that will be presented at the Central, regional, and branch libraries. The Jefferson County Community Arts Fund award is made possible through the Jefferson County Commission and is administered by the Cultural Alliance of Greater Birmingham. The funding was awarded just as the Cultural Alliance released an economic impact study—conducted by the national arts-advocacy group Americans for the Arts—of the arts in Jefferson County. The study revealed that Jefferson County’s nonprofit arts and culture industry generates more than $125 million in economic activity annually. The Cultural Alliance announced a total of $557,981 in awards in March. The Birmingham Public Library applied for funding in response to positive feedback from Library patrons attending recent BPL @ Night programs. Last year the Library welcomed visitors for performances by classical pianist Barry Vaughan, jazz musician Eric Essix, and experiential theater company Muse of Fire. This award will allow the Library to increase programs in regional and branch libraries, enhance advertising, and pay professional artists for performances during every month of the year. Evening programs bring people into libraries during hours of lowest visitation and create lively and vibrant community centers. For the benefit of city residents, many regional and branch libraries will be able to expand their performance schedules because of the additional funding. Two performances have been scheduled for August. BPL @ Night will present the very popular Cahaba Saxophone Quartet on Thursday, August 16th, at 6:30 p.m. in the Atrium of the downtown library. This professional group of musicians will offer saxophone music from a wide range of genres: from Baroque to Contemporary. Award-winning actress and storyteller Dolores Hydock will present "Newfangled Meets Old School," a story concert, at Springville Road Public Library on Thursday, August 30th, at 6:30 p.m.
Want some food for thought in a book that is a pleasure to read? Consider checking out Bestselling author Barbara Kingsolver’s newest book Animal, Vegetable, and Miracle:A Year of Food Life. This nonfiction title cleverly blends an engaging memoir of her family's year of living on home grown and locally produced foods in southwestern Virginia, with thoughts on rural life, the global food industry, health and local farmers' economics. Writing in a manner both folksy and witty, she describes how her family lived on the land like our ancestors in the days prior to refrigeration and worldwide food distribution. Peppered within this entertaining and informative adventure in home grown eating are useful tidbits of information like recipes, food facts, and how to advice from family members. These additions give the book an enjoyable family scrapbook feel. Opting for back-to-the-land living, was not always easy. Cultivating their land and living on local foods for a full year leads to eye opening family adjustments for the Kingsolver's resulting in some comical "fish out of water" situations. In the age of globalization in which we live, foods often travel around the world before arriving at our supermarket. In dramatizing her own family’s story, Kingsolver suggests rethinking the process of how food gets to your table and brings to life the rewards of buying food that is locally grown.